SOLANA BEACH — Nonpartisan beach politics took center stage over blue wave enthusiasm at a recent Rancho Santa Fe Democratic Club meeting in Solana Beach — for the most part. 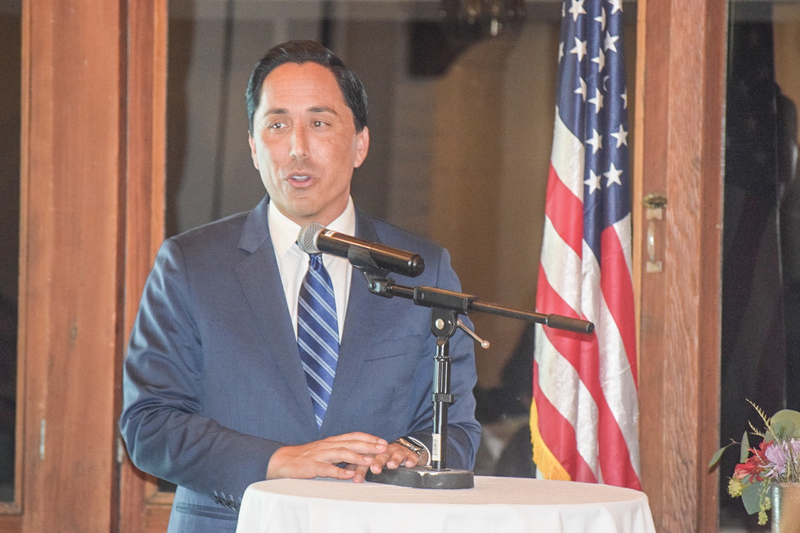 Assemblyman Todd Gloria stopped by the Jan. 10 meeting to reiterate his intention to run for mayor of San Diego in 2020, news that he announced in a Jan. 9 video posted on social media. Gloria is currently a democratic member and majority whip of the California State Assembly. He represents District 78, which stretches along a large portion of San Diego County from Imperial Beach to Solana Beach. Among his priorities as potential mayor, Gloria is looking to combat homelessness, secure affordable housing and work on a more robust transportation system. He reminded attendees of his eight-month stint as interim mayor of San Diego in 2013-2014, following former Mayor Bob Filner’s resignation in August 2013. “I would like to say fairly and modestly, I think I did a decent job,” Gloria said. “I gave you the preview, now I want to show you the feature-length film. During his time as mayor, he oversaw the drafting of the city’s Climate Action Plan, which he hopes to take steps to implement in a full term. “I’m truly excited about the opportunity that we have in 2020 to finally and permanently turn this region blue,” he said, as club members celebrated the “blue wave” that overtook political offices at all levels in the region in 2018, including traditionally nonpartisan city councils. But the event’s dialogue soon turned to issues confounding both sides of the political aisle — with the state’s housing crisis at the forefront. Faced with mounting pressure at the state level to secure affordable housing options and a soaring demand locally, Encinitas Mayor Catherine Blakespear, former Solana Beach City Councilwoman Lesa Heebner and Del Mar City Councilman Dwight Worden discussed the potential solutions and barriers at hand. For Encinitas, the next big thing is accessory dwelling units, commonly referred to as granny flats. “To me, (granny flats) are a great way to add housing because it scatters density in a way that can be invisible,” Blakespear said. Blakespear lauded the option for being resident-driven rather than developer-driven. “It allows for multigenerational living, caregivers, all sorts of different flexible arrangements that people want,” she said. The city recently embarked on a program that will speed up the permitting process for such dwelling units by providing residents with pre-approved architectural plans that could save them thousands of dollars in design fees. The much smaller Solana Beach is also making headway in providing affordable housing. Heebner highlighted the recently approved Solana Highlands revitalization project, which will bring 32 low-income units to the city. However, she worried that measures at the state level, such as Senate Bill 50, would serve as a threat to cities like Solana Beach. Introduced in December, SB50 would require cities to grant certain density waivers to developers looking to build residential developments within a one-half mile radius of a major transit stop. Worden pushed for “creative solutions” to the housing crisis in coastal cities. With zero official affordable housing units under its belt, Del Mar has approached the Del Mar Fairgrounds 22nd District Agricultural Association board of directors about potentially establishing affordable housing on the fairgrounds’ property — which falls into Del Mar’s city limits. Worden said that when it comes down to either spreading affordable housing around the city or attracting a few big, high-density projects, he prefers the former. However, “the trickiest thing” is getting the community to come to grips with affordable housing requirements. “None of the above is not an option,” he said.